It is now 5:11 PM PDT Time on Sunday, April 21, 2019. Elk Lake, OR August 1-2-3, 2014 5 Swims in 3 Days! LOCATION: Elk Lake, a beautiful, clear mountain lake nestled in the sunny Oregon Cascades 33 miles from Bend. Water temperature is expected to be 66-69 degrees F. and will be posted on race days. RACES: The Cascade Lakes Swim Series features five open water swims over three days. Adult participants may enter any or all of the five swims. Friday’s swim is a 3000-meter swim on a triangular course. Saturday’s swims are an individual 500-meter time trial on an out-and-back floating line course and a 1500-meter swim around a triangular course. Sunday’s swims will include a 5000-meter swim consisting of three loops of a diamond & triangular course and a 1000-meter swim on an irregular course following the shoreline. Pre-race instructions 15 minutes before each start time. A picnic lunch or dinner will follow the finish of races each day. SERIES: The Cascade Lakes Swim Series includes a Short Series (500, 1000, & 1500-meter swims) and a Long Series (1500, 3000, & 5000-meter swims). Each swimmer may enter one distance series only and must complete all three series swims to be eligible for series awards. For series awards, points will be based on finish order in each race, with a Category II suit deduction (10% time penalty). Swimmers who complete all FIVE swims will win special Survivor awards. ELIGIBILITY: Open ONLY to 2014 USMS members or foreign equivalents, who must be adults 18+ on Friday, August 1, 2014. A legible photocopy of your USMS card (or foreign equivalent) MUST accompany mailed entries. USMS “One-Event” membership—covering all races except the National Championship 5000-meter swim—is available for adults 18+ only for $18. Swimmers with USMS One-Event registrations may enter the 5000-meter swim, but will NOT be eligible for the USMS National Championships in this swim and will start in a separate wave; these swimmers will still be eligible for the Long Series and the Survivor Series provided that they complete the requisite swims. RULES: USMS rules will govern this event. Category I suits are required for the Championship 5000-meter swim. Category II suits—including wetsuits—are welcomed in all swims, but scored in a separate category. See event website for swimwear details. STARTS & SEEDING: The 1500, 3000 & 5000-meter swims will use a mass start (separate wave in USMS 5000-meter championship swim for Category II suits). The 500-meter swim will have individual starts and the 1000-meter swim will start in small heats; both swims will be seeded fastest-to-slowest based on 500-yard seed time. Day-of-Race entries and those not submitting a seed time will not be seeded in advance and will swim last. No changes allowed in seeding times at the race, so enter accurate times. SAFETY—OUR PRIMARY CONCERN: Safety boats will monitor the entire course and medical personnel will be on-site. Swimmers must wear a brightly colored swim cap, have their race number on their arms or hands, and follow all announced safety rules without exception. Mail entries should be postmarked by July 21. Online entries must be completed by midnight July 26. Entries completed online or mailed/postmarked July 22-26 must pay an additional $10 late fee. DO NOT MAIL AFTER July 26! Entries after this date will be considered Day-of-Race entries and must pay an additional $20. Submit your entries on time! ENTRY FEES: One race is $35, and each additional race is $5 more. Entry fee includes a swim cap and post-swim meals on your race days. INSURANCE SURCHARGE: There is a required $6 per swimmer surcharge to help cover the cost of USMS-mandated event insurance. RESULTS: Will be posted at Elk Lake promptly after each race and at www.comaswim.org and www.swimoregon.org after the event. Medals to eight places in each age group in the USMS 5000-meter championships. Championship patches to the USMS winners, who are required to be full USMS members. Ribbons to three places in each age group in all other swims in both suit categories. Ceramic coasters to the top 3 Series finishers in each age group. Ceramic mug to the top masters male & female in each Series. Special Survivor glass mug to everyone completing all five swims. 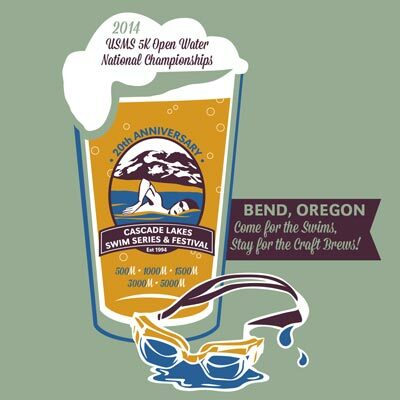 OREGON OPEN WATER SERIES: All swims count towards the cumulative season series. The 1500 & 5000 are featured swims, while the 500, 1000, & 3000-meter swims are qualifying swims. DIRECTIONS (Mapquest: Elk Lake): From Century Drive in Bend, take the Cascade Lakes Scenic Highway approximately 33 miles to Elk Lake. The start & finish for all swims is the Beach Day Use Area, the southernmost exit, and last Elk Lake exit if coming from Bend. PARKING: Parking is limited to two large pullouts off the Cascades Lakes Highway, the Six-Lakes Trailhead, and the Little Fawn Group Campground. A shuttle will run Saturday & Sunday between the campground, trailhead, and the race site before & during registration and after races are completed. There will be no general parking at the race site until after event activities have concluded. Your car must display a 2014 NW Forest Pass to park anywhere other than the highway pullouts, trailhead, or campground. CAMPING: By pre-registration only (first come first served), we have reserved Little Fawn Group Campground for swimmers & spectators Thursday through Sunday. Only tents or small motor homes are permitted. Camping fee is $8 per day per camper 12 years or older—include fee with your entry form to secure your spot. Limited parking at the campgrounds! NO drop-in camping! Camping for FRIDAY and SATURDAY night is FULL. DOGS: NO DOGS at Elk Lake (USFS Rule), but they may be in the campground on a leash. Never leave your dog unattended in a car! FESTIVAL: Elk Lake is a great place to bring your family for a fine outdoors experience and extravaganza. Think FESTIVAL! We are offering a 20th Anniversary T-shirt as well as an 20th Anniversary Ceramic Mug (similar to the awards mugs). Below is the t-shirt design, and the mug will have the same logo that appears inside the glass. T-shirt orders close July 21. Online Registration closed on 7/26/2014.